(Photo: Reuters Jason Reed)U.S. President Barack Obama (L) listens to Desmond Tutu as he visits his HIV Foundation Youth Centre and takes part in a health event with youth in Cape Town, June 30, 2013. 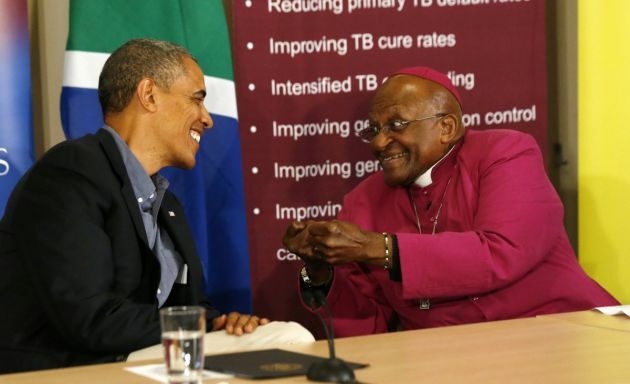 Retired Anglican Archbishop Desmond Tutu has welcomed U.S. President Barack Obama to a clinic his foundation runs to fight HIV and AIDS as both of them praised the legacy of Nelson Mandela. The U.S. president said in a speech on his last day in South Africa, "Nelson Mandela showed us that one man's courage can move the world." Obama and Mandela share being the first black presidents of both their countries, but the South African spent 27 years in jail before winning the right to contest for the leadership of his country. Obama on Sunday visited Robben Island near Cape Town where Mandela spent many of his years languishing in prison. At a clinic on the U.S. president's final day in the South African sector of his African visit Tutu hailed his fellow Nobel Peace Prize Laureate Mandela as a person who still unites his fellow South Africans from the hospital bed where he is battling for his life. "Now after a lifetime of service, of giving, even stricken as he is in hospital, Madiba [Mandel's clan name] is uniting the nation again, this time in prayer," Tutu said on Sunday. Tutu noted the outpouring of wishes and prayers from all South Africa's races who fought a bitter struggle during the apartheid era until Mandela's release from prison in 1990. Tutu said Mandela is still a bridge across the sometimes bitterly divided nation of South Africa. "When we look at the photographs around us we remember how special we felt… how incredibly hopeful… a nation united… around Madiba." The former Archbishop of Cape Town, said, "Although our hearts are heavy, may we have the strength and the good sense to recognise this moment for what it is: an opportunity to reflect just once again on our promise to harness our collective energy." Mandela has now spent 24 days in a Pretoria hospital and Tutu said it is a "somber moment in the life of our country." "We pray for his comfort and his dignity. We pray that we will be ready to commit him into the hands of our loving God." Tutu said, "We come here not to lament, not to mourn but to remember some of our most special moments with Madiba." In his speech Tutu spoke warmly of Obama's legacy. "When you became the first black incumbent of the White House you don't know what you did for our psyche. "My wife sat in front of a TV with tears running down her face when she watched the celebrations in Chicago. ... So welcome home, even if you're about to go," Tutu said. He noted, "We want you to be known as having brought peace to the world, especially as one who brought an end to the anguish to all in the Middle East. "We pray you will be known as having brought peace to all the regions where there has been strife and peace and no need for Guantanamo Bay detention centre ... We are proud of you. You belong to us."